Below are the complete details of the Associate Professor jobs in The University Of Lahore in Islamabad. Skills Required for Job: Having Good Communication Skills. Having Good Team Working Skills. Skills:- Listening, Speaking and writing & Analytical and Problem solving skill. 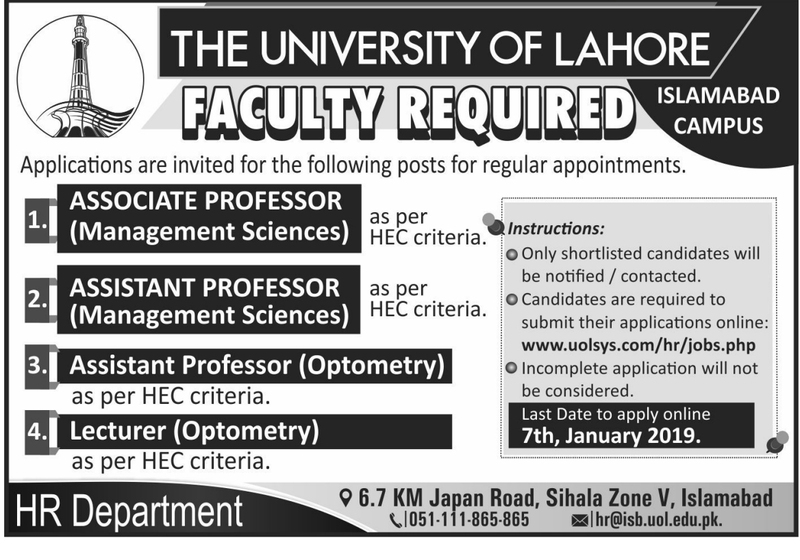 Qualification: The University Of Lahore Islamabad Campus Jobs For Associate Professor. This Post Shall be Filled on Permanent Basis. Attractive Salary Package. Last Date for Submission of Application 7th January 2019. 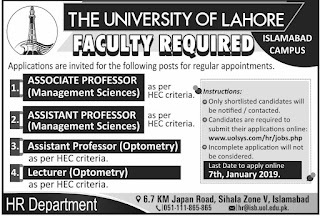 Associate Professor jobs in The University Of Lahore Islamabad, in Pakistan published on Paperpk.com from newspaper on December 29,2018. Job seekers who are already working as Associate Professor , Professor , Senior Associate Professor , Junior Associate Professor , Associate Professor Physics , Associate Professor Maths , Associate Professor Islamiat can also apply for post of Associate Professor.